Quality school signs that help you inform and inspire. America's largest school sign company! School signs provide the essential means of communication between the school and its community, parents, students and teachers. We have provided quality signs to elementary schools, middle schools, high schools, colleges and universities across the country and around the world. 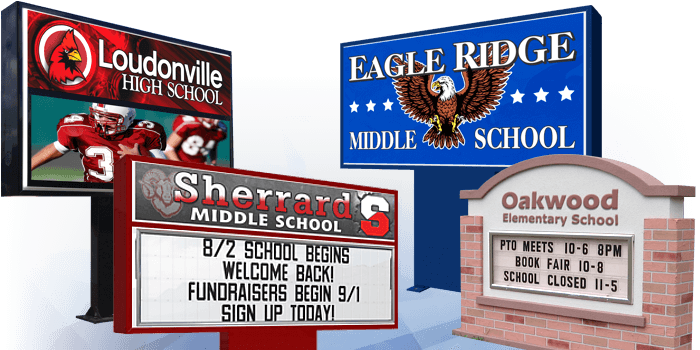 Our digital displays offer your school state-of-the-art sign technology combined with the highest level of quality and service. Project a dynamic presence into the community! Our changeable letter school signs allow you to effectively communicate with all who pass by. Easily and safely change letters with our Glide & Lock© support system. When graphic appeal and boosting awareness are your focus, these signs are the solution. Identify your school, enhance your grounds and become a source of civic pride. Bring large-scale video capabilities to your events with a state-of-the-art LED video wall. Turn any wall into a dynamic centerpiece and take your school to the next level! Our consultant was extremely helpful in all stages. We were in the inquiry phase for a year before we were able to purchase a sign. She provided us a perfect balance of help, ideas, and follow-up without being "pushy." The customer service has been far above most that I deal with on a daily basis. Learn about the beautiful LED sign at GRC High School! Lawrence County Schools use multiple LED signs throughout their school district. Attractive school signs that build school pride.